With the untimely passing of our Brother Knight Chris Patton, his widow, Nina, is working through details of her financial situation and facing some timing issues for SGHS tuition next year for her two daughters, Bridget and Mason. The officers unanimously approved a $1K donation at the June 4 business meeting to help fund tuition for SGHS next year. A generous member of the St Bridget family, anonymously donated the tuition for their third daughter, Quinn’s tuition to attend St Bridget school next year. While respecting Nina’s request for privacy, a group of school parents are reaching out to people who care about the Patton’s to solicit additional financial support. If any individual Knights would like to contribute, you can just send a check to the below contact at SGHS We are confident with the generosity of people that care about the Patton family, SGHS will work out some type of arrangement on timing of tuition payment. Thank you for the SBCC blood drive yesterday. We registered 12 people and collected 12 units. I think there was a lot going on which may have taken away from the blood drive – as well as nice weather after a week of rain! The next drive is August 30th. Identity is a theme to which Pope Francis has returned often in his daily preaching. He speaks of Catholics, metaphorically, as having a certain “identity card,” as valuable and consequential as a passport or a driver’s license. Our legal documents record important details such as our eye color, hair color, and home address. These details matter to us, but they are superficial; they can change over time. Pope Francis, however, speaking from the Catholic tradition, is more concerned, as we are in this letter, about an identity that is essential, enduring, and true. We must talk about the identity we receive in baptism. It cannot be taken away from us. It is permanent. Indeed, it is all we can hope to keep at the end of our earthly life. Thank you brother Mike Kozak for sharing this information! Recommended Reagan Leahey and Charlie Garbett as winners to receive our $1,000 Catholic High School Scholarship Award. They will be attending St Gertrude and Benedictine College Prep this fall. Both scholarship winner graduated with 39 other students from St Bridget School on June 1st. Vice Principal George Sadler presented many awards to the students including our award certificate to Reagan and Charlie. Msgr Carr and I were on hand at the graduation reception to congratulate our winners and take a photo for our church Bulletin. Please extend your congratulations to these worthy students and their parents. Please extend your congratulations to our new Knight Dan Harms! 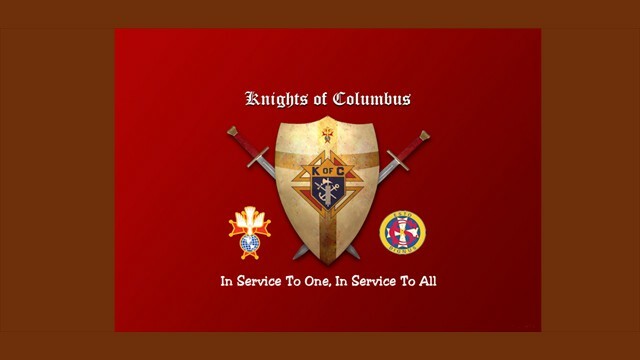 Dan exemplified to the second degree on Thursday with 20 other Richmond Knights at Vietnamese Martyrs Church. St Edward Church will be hosting a Third Degree Exemplification Ceremony on Saturday June 6th from 11AM until 2PM. Brother Second Degree Knights you are encourages to advance to the Third Degree at this time! Be aware that Third Degree Ceremonies in our area only come once or twice per year. Please let me and Chancellor Dale Matanic know you wish to exemplify this coming Saturday. Our Catholic High School Scholarship Committee has selected the two scholarship winners for our $1,000 scholarship award. Their names will be mentioned at the Eighth Grade Closing tomorrow evening at our church ceremony. Afterward Msgr Carr and I will congratulate our two winners. Special Olympics June 12-13th. At U of R and at Bowl America – Please sign Up. Contact GK Paul for sign up and specifics.